Movement of commercial motorcycle operators, popularly known as Okada, has been restricted around the area to prevent fire outbreak. Residents of Fagbile Estate in Isheri Ijegun Road, a suburb of Lagos, are currently living in fear. In fact, they are reported to have fled their homes because of a broken petroleum pipe which spilled its content in the area. One of the residents said that she was woken up by the smell of fuel from the broken pipeline. According to her, she saw some people carrying fuel in different kegs at about 6.00 am when she woke up to prepare food in her shop. 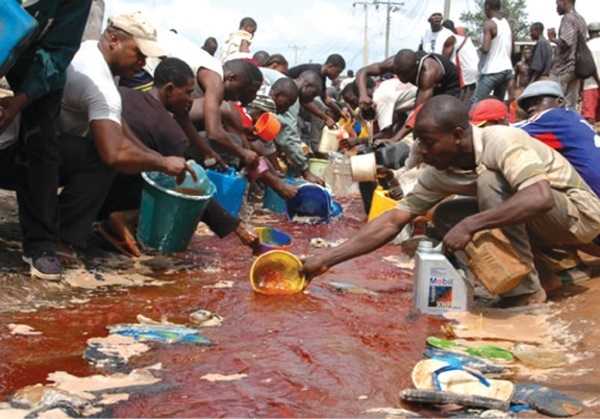 “At about 6.00 a.m, when I came out to prepare food, I saw the movement of people from the direction of the broken pipeline carrying kegs and buckets of fuel. “I became afraid that if the pipe is not repaired, a repeat of the Ijegun fire might occur,” the women said. As at the time of filing this report, movement of commercial motorcycle operators, popularly known as Okada, had been restricted around the area to prevent fire outbreak. Reports say the pipeline was allegedly broken by vandals in the early hours of Thursday, and the residents are urging concerned authorities to urgently intervene.